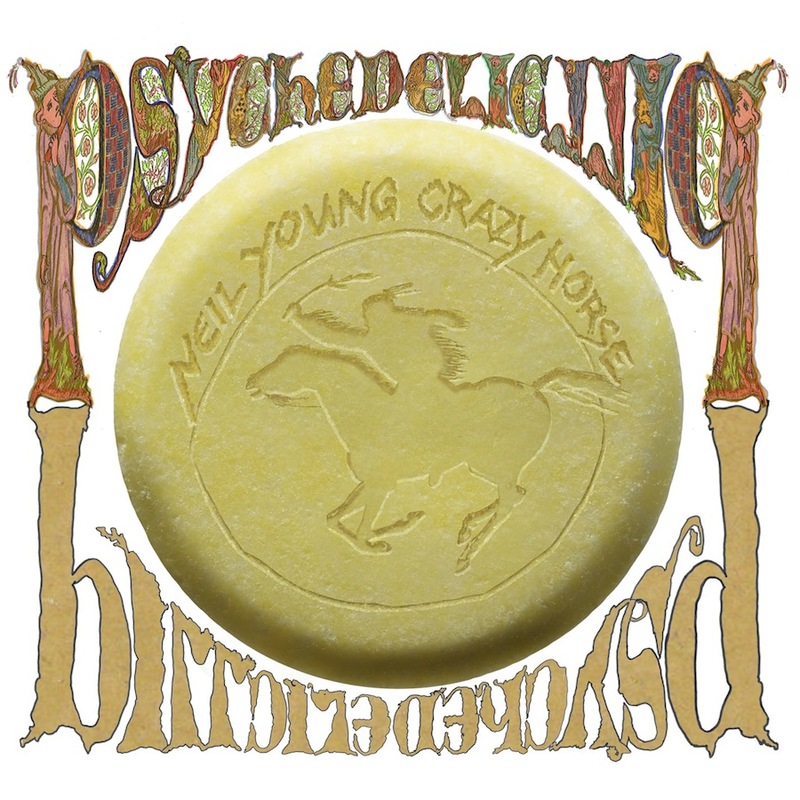 Baugh's Blog: CD Review: "Psychedelic Pill" by Neil Young & Crazy Horse"
CD Review: "Psychedelic Pill" by Neil Young & Crazy Horse"
Two studio albums from Neil Young and Crazy Horse in the same year – how awesome is that? Americana – the band’s rock ‘n’ roll take on an eclectic mix of (mostly) traditional folk standards – was released back in early June. And now here we are, before the year is out, with another CD. 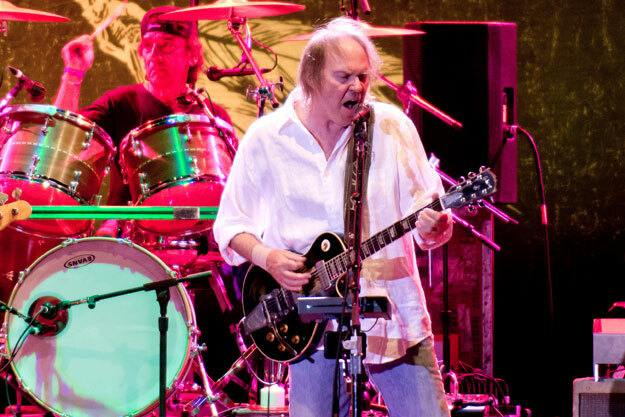 Psychedelic Pill is studio album #35 for Neil Young. It’s also his longest studio album ever, and the first to span two discs. It clocks in at 87 minutes – despite the fact that it contains only nine tracks. It’s the first album of original songs he’s done with Crazy Horse since Greendale, back in 2003. 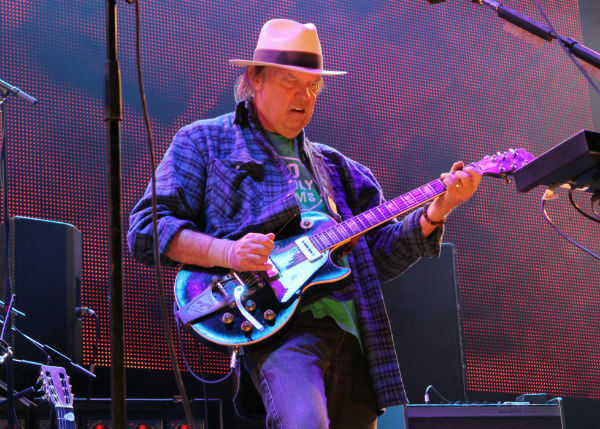 It’s been a busy and fruitful year for Neil Young. In addition to the release of the Americana CD, his autobiography – Waging Heavy Peace – was published by Blue Rider Press in September. The new album can be seen as a sequel to both of those projects: musically, it was built on a series of jam-sessions he did with Crazy Horse following the completion of their album of traditional material; lyrically, it explores many of the themes that Young raises in the recent book. And now he’s in the midst of a long tour that helps promote all three projects – although he’s more likely to be doing it for the love of playing live with the Horse, than for the need to push product that many Young fans – me included – will have already bought. Friends of mine who saw them play recently in Toronto and Kitchener say that both concerts were great. Psychedelic Pill kicks off in an audacious fashion – the very first track is a loose, twenty-seven minute epic called “Driftin’ Back”. It’s pretty much a two-chord piece that goes on and on and on, with Neil providing extended lead-guitar solos over Frank Sampredo’s rhythm guitar. The song’s often-bizarre lyrics raise several topics that come up repeatedly in Young’s recent autobiography, Waging Heavy Peace. Much of it sounds random and improvised: “I used to dig Picasso / Then the big tech giant came along / And turned him into wallpaper”; “Hey now now, hey now now / Gonna get a hip hop haircut / Can’t get me no resolution.” About this song, Neil says, “Things that bother you fade away to maybe return as a shadow, not so big.” So the title “Driftin’ Back” doesn’t mean so much that he is returning with sentiment to the past, but that the things that keep bothering him, and that he tries to keep under control (“blockin’ out my anger”), seem to keep drifting back to haunt him. As an opening track, “Driftin’ Back” ought not to work as well as it does. It’s an amazing risk he takes here – starting the album in such a guileless manner. 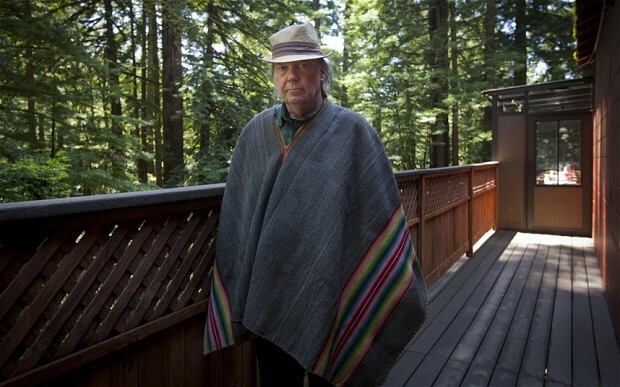 But that’s the way Neil Young works. He invariably comes at you out of left field, and does the unexpected. What this introductory track really does is to boldly establish Neil’s modus operandi – to lay out the album’s basic aesthetic: loose, extended, guitar-dominated rock of often uncompromising intensity, with simple and artless lyrics that eschew any big statements. Sit back; turn up the music to LOUD; and let the extended guitar workouts carry you where they will. Besides the rockin’-out epic tracks – of which more later – there are some short, more modest pieces. 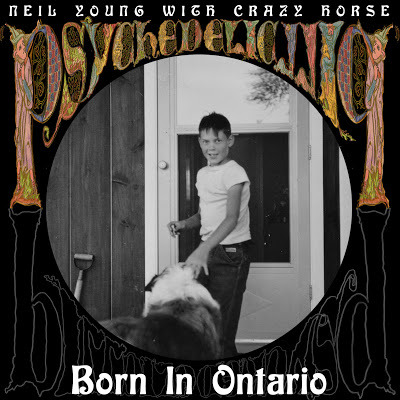 “Born in Ontario” is, in spirit, a sequel to Young’s CSN&Y track “Helpless” – invoking his childhood in Omemee with parents Rasa and Scott Young. He looks back with gratitude to those days, but he is often prompted to do that, he says, by a need to “try to make sense of my inner rage.” Neil’s playing of a pump organ in the final section of the song is a nice touch that adds to the nostalgic atmosphere of the track. “Twisted Road” is a song that Neil’s been doing in concert for years. 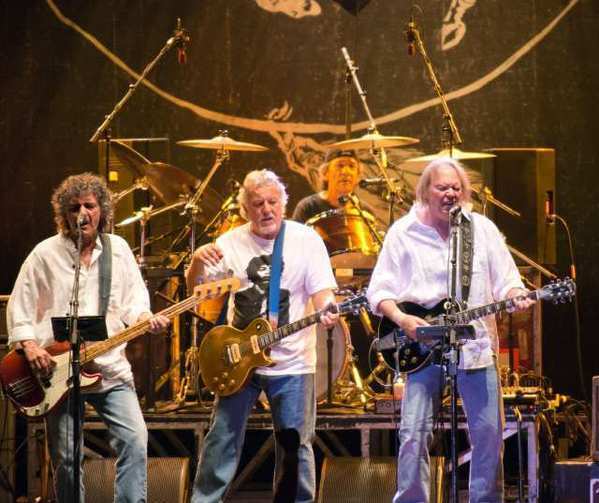 The song – given a rather brief rendition here – is a tribute to several of Young’s musical heroes: Bob Dylan, the Grateful Dead and Roy Orbison. His image of Dylan singing “Like a Rolling Stone” is brilliant: “Poetry rolling off his tongue / Like Hank Williams chewing bubblegum.” Music from the past is also evoked in the album’s title track, “Psychedelic Pill”. He uses flanging (aka phasing) throughout the track to intensify the psychedelic atmosphere of the piece – a lyrical portrait of a sixties party-girl whose “every move is like a psychedelic pill / From a doctor I can’t find.” The use of flanging throughout the track is a mistake – the effect works better when it’s used sparingly. Recall, for example, its brilliant use in The Small Faces’ single “Itchycoo Park” (summer of 1967), where it is used three or four times during that recording in brief five-second snippets. There is another (unbilled) version of “Psychedelic Pill” tacked on to the end of the album, with all of the flanging removed. Many will prefer this unadorned interpretation. “For the Love of Man” is a complete change of pace. Some might think it doesn’t really belong on this album. It’s a pensive, acoustic song about Neil’s son Ben – one of two sons that Young had who were born with Cerebral Palsy: “Some things can never be understood,” Neil writes; “These are the things that keep returning, making you wonder.” He and wife Pegi spent long and difficult years caring for the boys – finding the best care and treatment they could. And those long years together with Pegi inspire “Ramada Inn”, my favourite track on Psychedelic Pill. The lyric portrays, from different perspectives, their life on the road. The refrain sounds a positive note: “And every mornin’ comes the sun / And they both rise into the day / Holdin’ on to what they’ve done.” But the last verse raises a more troubling tone: “A few drinks now and she hardly knows him / He just looks away and checks out / When she says it’s time to do something … He just pours another tall one / Closes his eyes and says ‘that’s enough’.” The lyric is delivered with typically-sweet Young and Crazy Horse harmonies. But it’s the guitar playing – the improvised solos that run through the track – that lift this song to another level. And what makes the guitar-work so astonishing is the sound he gets out of ‘Old Black’, his 1952 Gibson Les Paul. 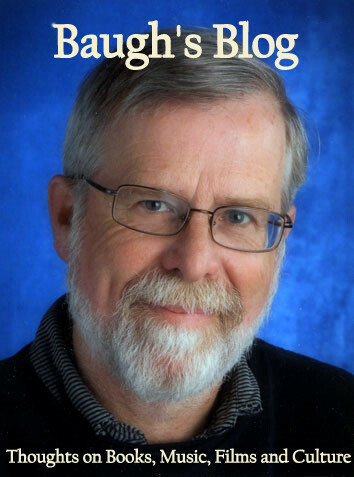 I talked about Neil’s obsession with recorded sound on my review of his book, Waging Heavy Peace. 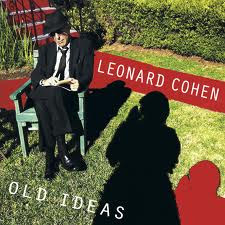 And what you hear on this album bares out exactly what he’s on about. The liner notes in the accompanying booklet explain the album’s A-A-D recording. The music was played through an old-fashioned (analog) tube console – a Universal Audio mixer called the “green board”. (Young talks about this equipment in his book.) It was recorded to Studer 2” eight-track analog tape, mixed to Ampex ½ inch two-track tape, and finally transferred to 24-bit digital. If you play this album through a decent set of speakers, the guitar tone you hear is awesome. The multiplicity of sounds that Young pulls out of ‘Old Black’ is astonishing. Play it loud! "I used to walk like a giant on the land; Now I feel like a leaf floating in a stream." And then there’s Walk Like a Giant – the third epic on this album. This is a mesmerising piece of music. The theme of the lyric is about regret and failure – the failure of the sixties counter-culture to sustain its idealistic hopes for the future. “Me and some of my friends,” he sings, “We were going to save the world / We were trying to make it better.” But a cultural reaction set in: “the weather changed”, is how Young puts it. And there is regret and anger. The regret is expressed in this lovely image: “I used to walk like a giant on the land / Now I feel like a leaf floating in the stream.” The anger is expressed in an onslaught of incredible guitar sounds. Neil plays his heart out improvising. He’s all over the place on his fretboard – deep, growling howls of sound, and ringing tones from the higher strings. It’s extraordinary stuff – similar to the wonderful sounds on “Ramada Inn”. But the aggressive tone is softened by an incongruously jaunty riff that is whistled by the band intermittently throughout the song. And then the track ends with an incredible coda: it begins with Neil and Ralph Molina (the drummer) pounding out a huge, incessant, thumping noise – giving us an impression of a giant bestriding the land. They hammer away, coming in and out of synch with each other. This long thumping then evolves into sustained feedback. And so it goes for four minutes. Astonishing. 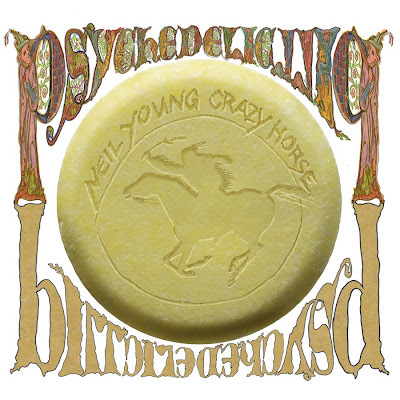 Another tremendous album, then, from Neil Young and Crazy Horse. It won’t be to everyone’s taste. It’s a typically uncompromising approach to music-making. Take them on their own terms, or don’t bother. There are a few rather inconsequential pieces here, but overall this is a straight-ahead, intense album of no-nonsense guitar rock. If you are familiar with the brand, you’ll love this. How do they keep doing it? Neil’s on an extended roll. Long may it run. Some say the noise coda at the end of "Giant" ends with the giant falling down. I keep picturing Neil reaching inside the giant amp and tweaking a comically huge knob during the feedback section. I kept hearing ghost of the melody in the feedback as well (at the ACC). Book Review: Charles Dickens 12 - "Little Dorrit"